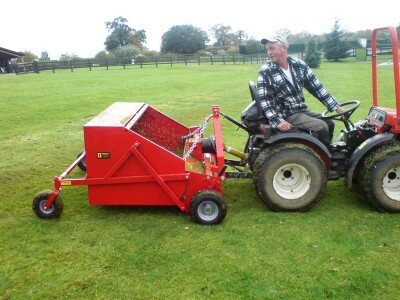 The tractor driven sweeper/collector is ideal for smaller tractors, it has a working width of 4 feet / 1.2m. The powered brush rotates in the opposite direction of the tractor wheels, creating a degree of suction, and with sweeping motion, lifts the material over the brush into the hopper. It is designed to collect horse manure in pasture, sweep leaves and loose grass from lawns and sweep yards and roadways. The hopper is emptied by tilting it forward. The degree of sweeping is controlled by adjusting the brush. Also available larger models and engine driven model for use with quad bikes.